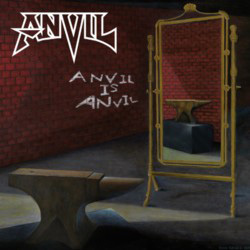 ‘Anvil Is Anvil’ is their sixteenth studio album since ‘Hard ‘N’ Heavy’ announced their arrival back in 1981, and despite comings and goings over the years Lips and Robb Reiner have in the main delivered consistently exciting releases. ‘Anvil Is Anvil’ is a worthy addition to their walk of fame, with eleven strong compositions (the digipack and vinyl making up the dozen with the addition of bonus track ‘Never Going To Stop’) and boasts a tough-as-nails sound courtesy of producer Martin ‘Mattes’ Pfeifer: songs like ‘Die For A Lie’ and ‘Runaway Train’ are as brutal as a smack in the face, and Pfeifer’s magic is the perfect sheen for the band’s not-for-compromise material. Lyrically there’s a fair bit going on too; critics often don’t really take Anvil seriously – the likes of ‘Butter Bust Jerky’ won’t have helped their cause, of course – but Lips often has a fair few points to make and revels in the likes of ‘Gun Control’. He even lobs in a nod to friend/mentor/supporter Lemmy in the Motörhead-esque ‘It’s Your Move’, all the more poignant since the Motörmainman’s death at the tail end of last year. Bassist Chris Robertson has clicked into place like the missing piece of a jigsaw and once more Anvil are set to take their latest record on the road. If you catch them, raise a glass to one of metal’s true survivors.